While we’ve been adhering to themes the past three weeks, and trying to bring you some great seasonal content- we’re back to our regularly scheduled program this week. Which means I’m bringing you a delicious dinner idea, that’s easy & budget friendly. 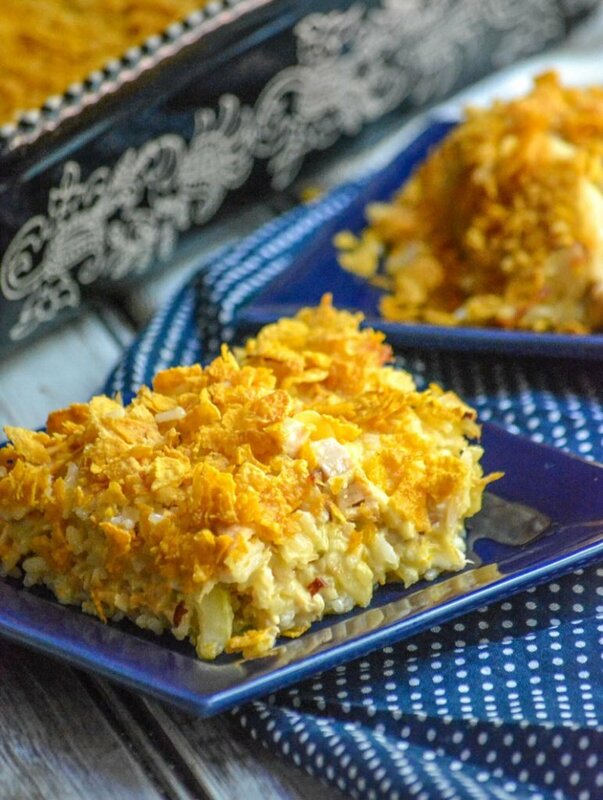 Y’all know how much I love me a solid standby recipe, and this Rotisserie Chicken & Rice Casserole is always ready in the ‘will call’ section of my recipe box. Casseroles, hot dishes, whatever you call them- they’re any busy parents blessing. Traditionally, growing up, dinner would be some sort of chicken-centered entree, and Gran would serve us several veggies on the side. Usually there’d be a bit of cream gravy to compliment everything. We lived for her gravy. On truly busy nights, she taught me her little secret. Mix everything up in one dish (pot/pan-you get the idea), and for the most part-serve it all together. It was genius! And delicious. Never heard a complaint out of us. You still will not hear a complaint out of me twenty-odd years later. I’ve made sure to keep that little trick in my back pocket, and often on my kitchen’s front burner. We typically do one massive grocery day a month, stopping in at all of our favorite stores and taking advantages of sales, etc. I like to keep a very well stocked pantry, freezer, and fridge. That way, no matter what the week throws at me- I’ve got plenty of options. Despite the monthly shop, there are still things I need to go to town for each week. There’s the obvious milk, bread, and fresh fruit for the kids’ lunches. However, there’s guaranteed to be a stop at Costco at some point in my week every week. Not only because that’s also where I stock up on bread and milk, but also because I insist on keeping at least two of their rotisserie chickens on hand, at all times. For an even $5 a pop, you get a whole roaster, enough to feed even a large family like ours. Some days, esecially on grocery day, it means I don’t have a plan for dinner and that giant bird is going to grace my table with a simple side of mashed potatoes and a canned veggie. 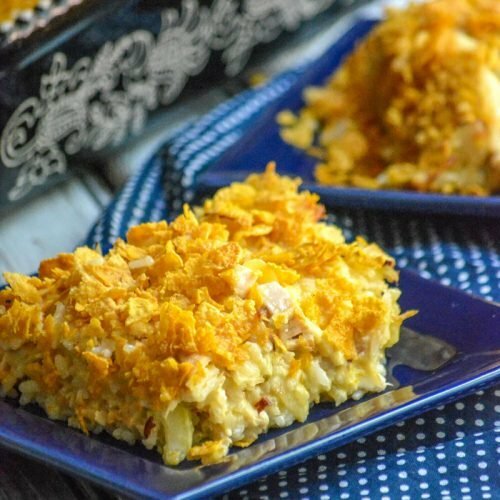 Other times, it’s because I can easily pull some prime meat off, chop it up and serve my family something as delicious as this Rotisserie Chicken & Rice Casserole. Also, a fun little fact I learned- there’s a reason Costco sells such giant rotisserie birds and regular grocery stores do not, at least not at the same price point. Most normal grocery stores sell there roasters, uncooked and as is, per pound. The smaller birds people are unlikely to buy, those are what they throw into their rotisserie. Smart business on their part. However, Costco can afford to be even smarter. They don’t discriminate, and sell them at a cheaper price. Meaning they make hardly any profit in this one area, but they gain loyal customers. So if you don’t already, I highly recommend keeping a chicken or two on hand. We get several meals out of every bird. The prime pickings go to a meal like this lovely casserole, and the remainder of the white meant and the always flavorful dark, go into things like soups and chicken salads. They can also be frozen and saved for later. The carcass goes straight into my slow cooker, with leftover veggie clippings from the week, for a savory bone broth to use in whatever recipes I like. The broth, once made, keeps in the fridge for up to a month, and is a flavorful infusion into any recipe it’s used in. I can’t even remember the last time I got so much for $5! Chopped rotisserie chicken, cream of chicken soup, cooked white rice, slivered almonds, mayonnaise, thinly sliced celery, and an optional sprinkle of cheddar are stirred together in a greased casserole dish. 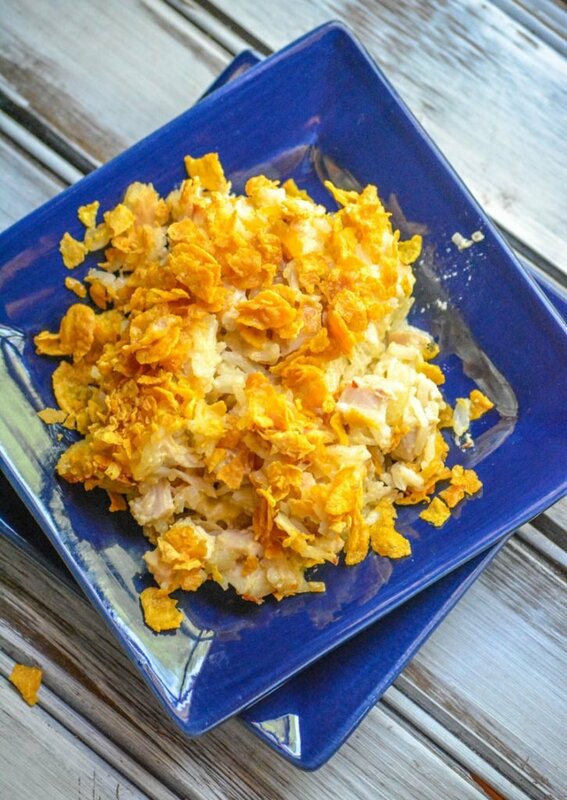 Topped with buttered, crushed corn flakes, this Rotisserie Chicken & Rice Casserole is baked for thirty minutes- to golden brown perfection. 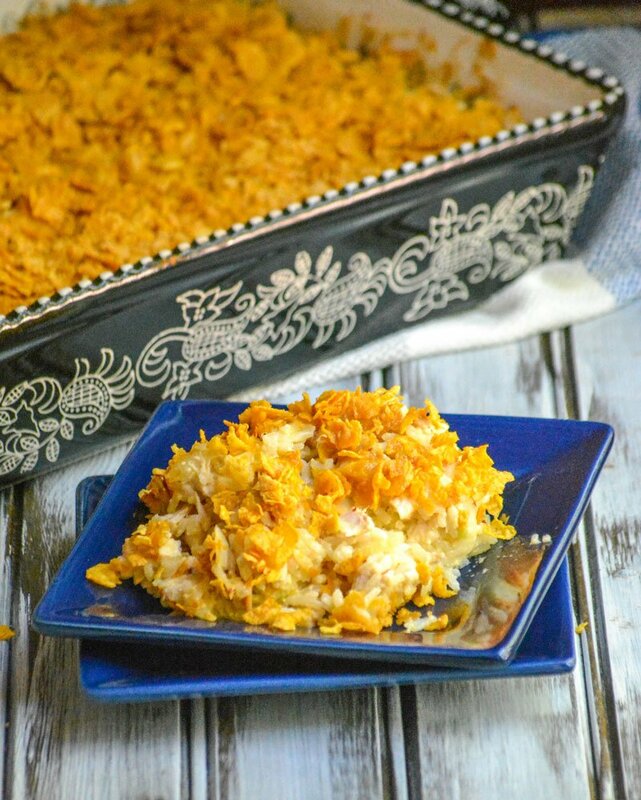 Served as is this delicious chicken casserole is a dinner the whole family will love. Served with a side of canned green beans, steamed broccoli, or a small side salad- it’s an easy meal they will absolutely rave over. 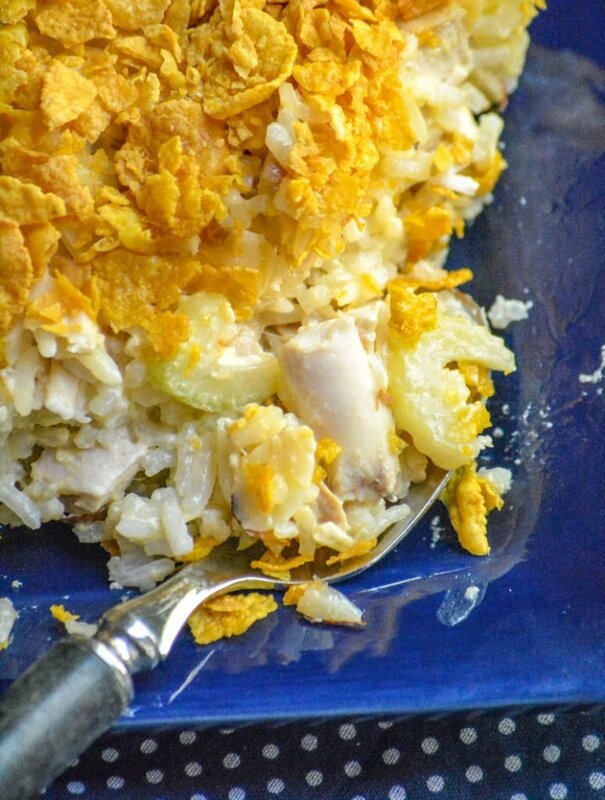 A quick and easy dinner, this chicken & rice dish features chopped rotisserie chicken, crisp celery, crunchy slivered almonds all baked under a crisp, buttered cornflake topping. 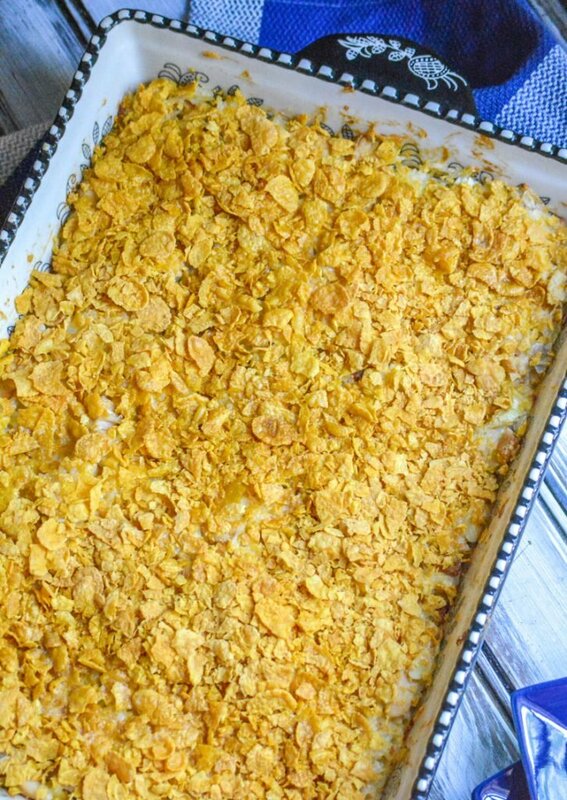 Add all of the ingredients for the casserole to a greased 9x13 baking dish. Stir together to evenly combine. 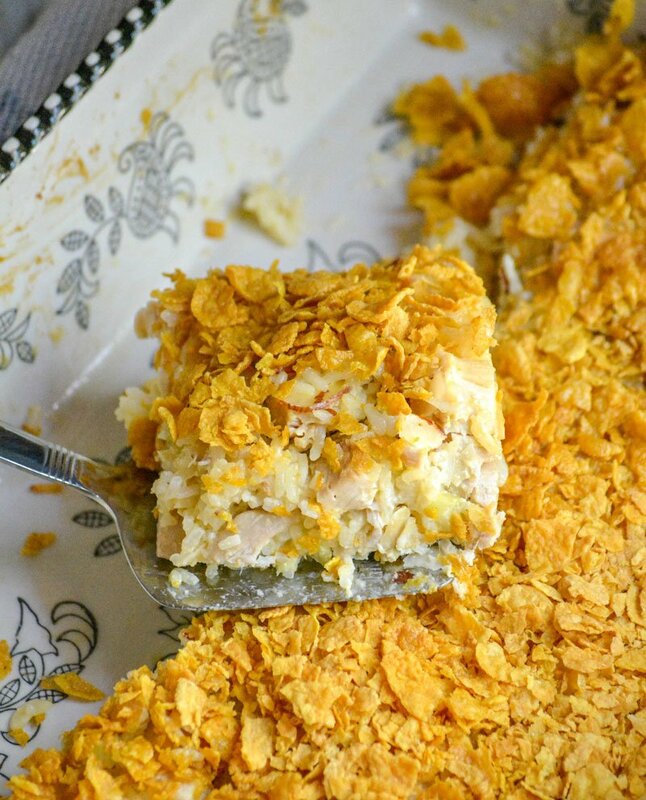 Add the cornflakes to a mixing bowl, drizzle the melted butter over them, and toss to combine. Spread the buttered flakes evenly out over the top of the casserole. Bake at 350 degrees for 30- 40 minutes, or until the topping is crispy and the dish is heated through.